Everyone, at least at some point in their lives wonders, “how does civilization end”? Climate change, natural disaster, war are the most common answers. The Bible talks clearly about the end, but has a different twist on future events and the ending. 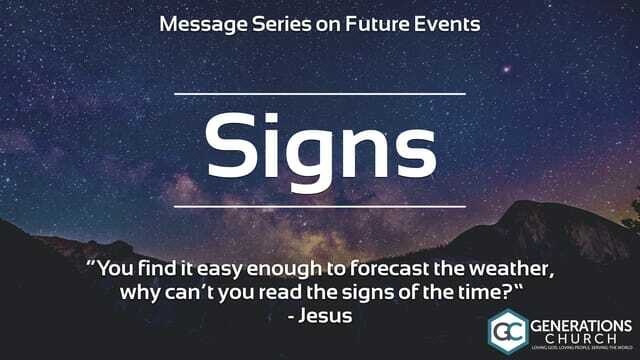 In this series, “Signs” we are going to look at what the Bible says about future events and how that information can and should influence our lives. If you have missed previous messages you can watch them on our livestream. If you have missed previous messages you listen to them on our iTunes podcast. Welcome to Generations Church! Please fill out this form to connect with us, or have a prayer request/praise report, or you'd like to respond to something in the message. Thanks and have a blessed week! Event Tip: Like what you're hearing during the message? Use the share options to post on social media, send a text, or email a friend. "You know how to interpret the appearance of the sky, but you cannot interpret the signs of the times." • Do you know what the signs of his return are? • Are you paying attention to them? What does the day of Jesus return look like? After that, we who are still alive and are left will be caught up together with them in the clouds to meet the Lord in the air. And so we will be with the Lord forever. Therefore encourage one another with these words. • Christ will return visibly, with a loud command. • There will be an unmistakable cry from an angel. • There will be a trumpet blast such as never been heard. • Believers in Christ who are dead will rise from their graves. • Believers who are alive will rise in the clouds to meet Christ. What does the world look like after this event? He has military power and is not afraid to use it. "And I will appoint my two witnesses, and they will prophesy for 1,260 days, clothed in sackcloth." They are "the two olive trees" and the two lampstands, and "they stand before the Lord of the earth. If anyone tries to harm them, fire comes from their mouths and devours their enemies. This is how anyone who wants to harm them must die." Now when they have finished their testimony, the beast that comes up from the Abyss will attack them, and overpower and kill them. Their bodies will lie in the public square of the great city—which is figuratively called Sodom and Egypt—where also their Lord was crucified. For three and a half days some from every people, tribe, language and nation will gaze on their bodies and refuse them burial. The inhabitants of the earth will gloat over them and will celebrate by sending each other gifts, because these two prophets had tormented those who live on the earth. But after the three and a half days the breath of life from God entered them, and they stood on their feet, and terror struck those who saw them. Then they heard a loud voice from heaven saying to them, "Come up here." And they went up to heaven in a cloud, while their enemies looked on. "So when you see standing in the holy place 'the abomination that causes desolation,'spoken of through the prophet Daniel let the reader understand"
His eyes are like blazing fire, and on his head are many crowns. He has a name written on him that no one knows but he himself. He is dressed in a robe dipped in blood, and his name is the Word of God. The armies of heaven were following him, riding on white horses and dressed in fine linen, white and clean. Then I saw a great white throne and him who was seated on it. And I saw the dead, great and small, standing before the throne, and books were opened. Another book was opened, which is the book of life. For additional reading check out the article below. Smart Giving is an easy and secure way to support Generations Church. Just click this link or text an amount to 84321.